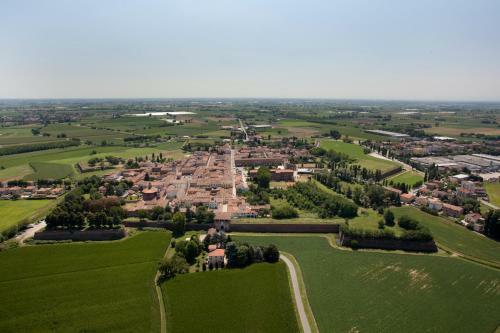 Mantua and Sabbioneta are towns in the Po Valley that represent aspects of Renaissance town planning. Mantua shows the renewal and extension of an existing city, while Sabbioneta represents the implementation of the period’s theories about planning the ideal city. Both towns acquired their wealth during the reign of various members of the Gonzaga family, between 1328 and 1707. Mantua was added late to the WH list, only in 2008. At that time, reading the particularly weak AB evaluation, I was wondering if it was worthy enough. The combination with Sabbioneta seemed difficult to explain, and there was no clear reason given why it would distinguish itself from other Italian Renaissance cities. Only recently I started to become more interested in Art History, even just finished a course on it as part of my General Cultural Sciences studies. Mantua popped up there quite prominently. It even got 2 entries among the 101 masterworks of European art and architecture. So I became very interested in visiting. The town is a bit far from everywhere, and it took me 2 hours to get there on a local train from Ferrara. From the train station it is a walk of another 15 minutes or so to the heart of the city, through quite unimpressive streets. My first goal was the Sant’Andrea basilica, one of the 2 “masterpieces”. Its dome can be seen from afar, but finding the entrance is a lot more difficult. The façade of this 15th century church is dwarfed by the neighbouring tower and shopping arcades. Leon Battista Alberti designed this church using the triumphal arch motif in both the interior and the façade. Inside I was surprised by how big it is. Unfortunately the nave is currently totally hidden under scaffoldings. At the back though, restorations of the dome and transept have been finished, showing of the same triumphal arch motifs and very elaborate painted and sculpted decorations. The small 12th century Rotonda San Lorenzo nearby is worth a quick look. Not far from it lies the Palazzo Ducale. It’s an enormous complex, I seemed to keep on walking and walking without seeing much. Most notable are the large black and red drawings on the walls called sinopia (pre-studies of frescoes) and the trompe l’oeil at the Camera degli Sposi. After enjoying a good lunch in town including the region’s specialty of pasta stuffed with pumpkins, I walked south. 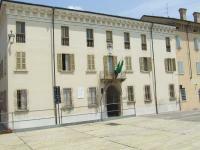 Here, in the former outskirts and on the site of the horse stables, the Palazzo di Tè was built. The second “masterpiece” according to my art history books. It is one of the first prominent examples of mannerism in Italy. 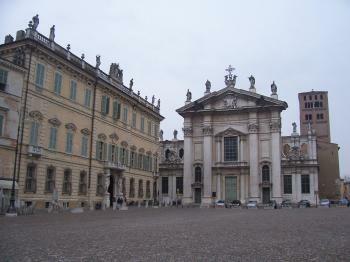 Mannerism means that not all should be perfect and straight, so the façade is covered with stucco decorations. Stucco is also repeated often in the interior too, where there are also rooms full of Flemish tapestries and paintings. Including the transport from and to Ferrara, I spent a full day in Mantua. The stunning city view mentioned by the other reviewers is also visible from the train, though it passes quickly. 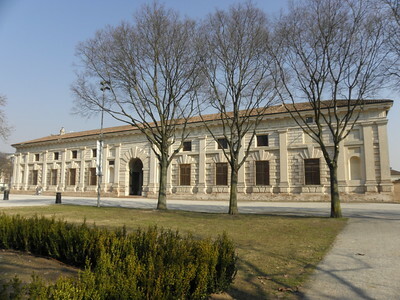 The towns of Mantua (Mantova in Italian) and Sabbioneta are paired into a single World Heritage site on the basis of representing two different facets of Renaissance city planning: the former an example of an existing city rebuilt and renewed, the latter a completely new town built according to the prevailing concepts of the ideal town of the time. 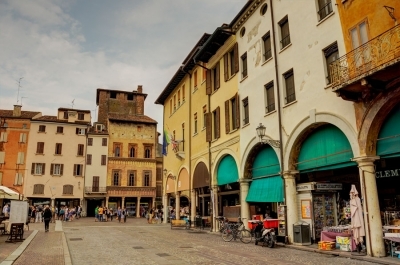 You can certainly see Renaissance influence in the architecture and un-medieval wideness of some of the streets around Mantua’s center. The most interesting architecture in town is concentrated around its historic core, focused on Piazza delle Erbe and Piazza Sordello. The latter, wide and spacious, is home to the Mantua Cathedral, the Ducal Palace, and a host of other impressive buildings. The time I allocated for seeing the town allowed me to visit the cathedral (ok, but not surpassingly remarkable) and the palace, which offers a couple of dozen of increasingly impressive spaces, sparsely furnished but boasting magnificent ceilings and wall frescoes and decorations. There is a number of visually arresting mansions and churches on nearby streets and squares. Sabbioneta has a small grid-like core of streets that forms the basis for its inclusion on the UNESCO list. I did not find anything exceptional there and left underwhelmed and disappointed. On a Saturday afternoon, not helped at all by the intermittent rain, the town looked nearly deserted and far from festive or even remarkable. I probably should have spent more time in Mantua instead. The key features of the main town square are the Ducal Palace and the Church (the sign on its side literally says just chiesa with no designation of a saint that it is dedicated to), which both might be lovely to look upon during the livelier times. I would be hard-pressed to call this World Heritage site a destination in itself. As an intraday stopover on some route, Mantua is certainly a pleasant choice and can easily provide a few hours of exploration entertainment. Sabbioneta is unlikely to appeal to anyone but the most hard-core experts on Renaissance architecture. I visited this WHS several times. Mantua is a special place in the Po valley with a truly unique panoramic view of the whole city just before approaching the main street. Both cities were ruled by the Gonzaga family and they played an important role in the dissemination of Renaissance culture. Those who travel to Mantua by car, should definitely take the SS10 from the east. The first view of the city “skyline” is overwhelming. From this perspective, the buildings are perfectly arranged: the Palazzo Ducale, the Castello San Giogio and the church towers. The city is surrounded on three sides by artificial lakes, which formerly served as a defence system and now contribute to the special flair of the city. We enjoyed it a lot to stroll through the historic centre. The main sights are located on three contiguous squares. The main square, the Piazza Sordello, is dominated by the Palazzo Ducale, a huge complex, which consists of several buildings with courtyards, gardens and connecting corridors. It is virtually a small city in itself. Parts of the palace can be visited, the most impressive room is the Camera degli Sposi with frescoes by Andrea Mantegna. Another highlight was the Basilica Sant'Andrea. We were extremely impressed, although the interior was under renovation and the nave was partially hidden by scaffolding (our visit was in August 2011). In the transept and the apse the restoration was already completed, so we could see the effects of the restoration in comparison to the parts not yet renewed. It will look magnificient when everything is finished. We spent two hot summer days and nights in Mantua. The restaurants and cafés were full with tourists and locals until late in the evening, it was very atmospheric. Exactly what you would expect from the summer in an Italian city. For dinner, we followed the recommendation of our hotel manager and went to the Osteria ai Ranari, a restaurant off the beaten track. Apart from us there were only locals, usually a good sign. We tasted local specialities: ragout of horsemeat and tortelli filled with pumpkin (tasted a bit sweet), both were delicious. Mantua was founded by the Etruscans and reached its heyday during the reign of the Gonzaga family, who ruled the city from the 14th to the 17th Century. In contrast, Sabbioneta is a planned ideal city built by a member of the Gonzaga family in the 16th Century. 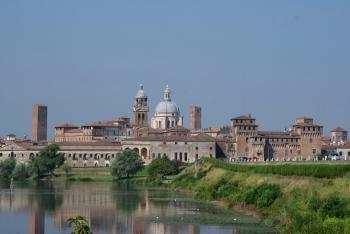 The city is located about 30 km from Mantua at the road to Parma. Sabbioneta has a completely preserved city wall and in this respect is comparable with Neuf-Brisach (Vauban WHS) or Palmanova (Italian T-list). Sabbioneta is less striking than Mantua and Sabbioneta alone would probably not have been included in the list. With a combined ticket you can visit four buildings: the Palazzo Ducale, the Synagogue, the Teatro Olimpico and the Palazzo del Giardino with the Galleria degli antichi. The latter is certainly the highlight. From the outside, the palace looks insignificant, but the interior is decorated with beautiful paintings illustrating scenes from Greek Mythlogie, e.g. Dedalo and Icaro, Philemon and Baucis, or the Orpheus myth. The most impressive part is the 100 m long Galleria, where once the art collection of the duke was exhibited. Unfortunately we could not visit the churches in Sabbioneta. The local priest was on holidays and has closed the eight churches. He has refused to give the keys to the tourist office. Obviously he is not very enthusiastic about the interest of tourists in his town. I do not understand why these two towns are linked in one site; there do not appear to have any physical connection. Mantova is reached by train from Verona and Padova (in the Veneto) while Sabbioneta is reached by bus from Parma or Casalmaggiore. From Mantova station a bus CC circulates around the sites, first to Piazza Erbe for Piazzas Sordello and Broletto and the Ducal Palace, then to Porta Pusteria for Palazzo Te. The pristine town of Sabbioneta is so small that it can easily be walked around. There is a real wow factor when approaching Mantua from road over ponte San Girgio, especially at night. The Castle and Palace were magnificently lit up as we crossed the lake that surrounds the city on 3 sides. We would have missed this entry had it not been for a strike on the Italian train system that led us to meet some very accommodating Mantovani's who offered to drive us from Verona, and take us on a special detour to see this great entrance to the city. So Grazie mille Mauro, Claudia and Daniel you made our introduction much more memorable. The next morning we had a walk around the centre which is very pleasant. There are several cobbled squares and large churches to view. The Basilica of Sant'Andrea was an undoubted highlight and well worth some exploration, the interior is very impressive. The main reason we decided to vist was to explore the sprawling Palazzo Ducale which takes up a whole quarter of the historic centre. It is mostly juts a standard rambling fortified palace with a few nice rooms, however it does contain a magnificent Bridal chapel painted by Mantegna which was an undoubted highlight of this trip for me. It was in courts like this that the renaissance really started to grow and develop and this impressive room is a great testament to this period. Mantua was a nice place to spend half a day in, and in many other countries would be an absolute highlight. It was certainly better than many other European cities inscribed on the list and our first view as we approached at night was magnificent. It is worth a trip if you have a half day spare in one of the most culturally rich parts of Europe. Horse Stables: Pallazo Té was built at the location of the horse stables of the Gonzaga family. Its main room depicts the favourite horses. Peter Paul Rubens: Mantua: lived at the court of Duke Vincenzo I of Gonzaga. Opera: Giuseppe Verdi's opera Rigoletto is set in Mantua. Dubbed as another WHS: Sabbioneta is dubbed The Little Athens of the Po. European Route of Historic Theatres: Italian Route, Sabbioneta – first free-standing theatre of the Modern Era, Teatro all'antica, built from 1588 to 1590 by architect, Vincenzo Scamozzi based on the Teatro Olimpico in Vicenza. Mantua – the "scientific theatre", Teatro Scientifico, built from 1767 to 1769 for the Accademia degli Invaghiti to plans by Antonio Galli da Bibiena.